It’s because they let themselves down and slack off, get lazy or worse – complacent and comfortable with the status quo. They don’t hold themselves to a higher standard or accountable to anyone or anything. I hear it all the time – NOT because I do what I do for a living, but because I have achieved and continue to achieve to my full and true potential, so I have always attracted the comments that goes with the territory of success. You have to be accountable. When was the last time that you really achieved something that you were proud of? I can bet I know ONE THING that is common across ALL INSTANCES LIKE THIS. You were held accountable to a higher standard. You had to follow a system, rules, regulations or other code of conduct. If you didn’t measure up, you were out, lost or got kicked ‘out or ‘off’ the team. The rules, goals, outcomes and rewards were set in advance. You committed UP FRONT to the whole thing and did not second-guess or hesitate halfway through. You did whatever it took to make it happen. You learnt lessons that you never expected you’d learn. You became a better person as a result of the experience. It was tough, hard and demanding and you miss every minute of it because you know it made you stronger, more capable and you relish that, feed on it and want more of it. Chances are no one is holding you accountable to your life, career/job or business venture. TOTALLY and ABSOLUTELY on your own. Floating in the wind hoping that when it blows, it’ll be in the direction you want to be going in. Even if you have had some success, you know there is a better way of doing things. The proof is right there in front of your eyes. People dumber, less educated and with a lot less capital and resources than you have are making more money than you, living a better lifestyle – without inheriting it or winning the lottery. People like Richard Branson, Bill Gates, Warren Buffett, Oprah Winfrey, Anthony Robbins and the list goes on and on… produce seemingly super-human results yet they have the same 168 hours in a week that you and I have. I am not one to compare myself with others and I don’t suggest that the above comparisons are worthwhile for anything other than making the point that if OTHERS can do ‘X’, then why not you? So, what is your true or full potential? If you don’t know already, my mission in life is “To keep living my dream and empower others to do the same.” I know what that sounds like, but I don’t care. I’ve lived my life that way since my teenage years. I want to ENJOY MY LIFE and HAVE NO REGRETS. Getting up in the morning and being excited about what lies ahead and happy with who lies next to you! Not feeling like you’re going to work, but are doing what you were meant to be doing because it’s fun, fulfilling and what you’re good at. Having time stand still when you’re ‘in the zone’ or in the ‘flow’ of the moment. Hours seem like minutes. You have a sense of contentment, serenity and peace within your being, soul and inner world where you live within your thoughts and feelings. You don’t feel like you’re trading your time for something else you’d rather be doing. The thing is that if money is YOUR ONLY MEASURING STICK, you have a problem. Two friends are at the cemetery burying their best friend and one says to the other “I wonder how much he left behind?” To which the second friend replied solemnly “… Everything”. That’s why I have focused on have what the popular press now calls “work-life balance”. I call it having a life. I share the following with you, not to impress you, but to impress upon you my values that ‘success’ is not just about making money. Monica and I have been together for 24 years. The only people we know who have been together longer are our parents who are all still alive, happy and healthy. Success starts with having people to share it with. Throughout those 24 years, we’ve lived in half a dozen different cities: Montreal, Toronto, Quebec City, Vancouver, San Francisco, Perth and now beautiful Sydney. I’ve worked with private and public companies on three different continents in 4 different industries as diverse as the printing industry, software sales, agriculture and ‘motivational’ event promotion. I’ve raised millions of dollars of venture capital, listing companies on both the NASDAQ and ASX stock exhanges. I’ve published books – “real books” that have been sold in major bookstores, one that won a prestigious North American Award. I’ve won several sales and marketing awards, the one I am most proud of was for the best promotion under $1,000 that proved that it doesn’t take money to produce results. My sub $1,000 campaign out-produced the winner of the $25,000 campaign! I’ve alrady won my first state-Level Master’s Squash Championship and competed in the World Masters Championships last year for the first time, placing in the ‘Top 50′ in the world. I have 5 university-level degrees in Engineering, Business, Law (Taxation and Wealth Creation) and Corporate Governance. Some people collect stamps, I collect university diplomas! Because I’m not superman. I have 168 hours just like you. Always have, always will. I’ve learnt amazing strategies from the very best in the world – you know the names – Anthony Robbins, Brian Tracy, Jay Abraham. These guys were the pioneers in peak performance, sales and systemisation and marketing respectively. What I’ve done is triangulate what I learnt from them like a GPS system that has multiple satellites to zero in on your location, to zoom in on PROFITS and RESULTS like a laser beam! I’ve achieved the results and have benefited from the rewards: 6 BMWs and counting, a sub-penthouse apartment with a clear and unobstructed view of Sydney Harbour and the city, in a building with a squash court, gym, spa and 25 meter pool. More important than that is the “revolution by design rather than evolution by default” of my business model since I retired from the ‘Rat Race’ in 2005 at 42 years of age — I’ve transformed my business model from 100% effort to a 80-20% effort vs value-based model to 50-50% and now 20-80%. Which means I have broken out to the entrepreneurial jail once again… All this in about 3 years. I speak of a Rivers Of Revenue and the Parthenon Profit Principle which means that I make money 24/7/365 even while I sleep, from multiple sources, regardless of where I am. That could not be further from the truth. I was successful in business BEFORE I studied for my MBA and I didn’t do a PhD in Business Administration to make more money, it was an intellectual challenge that I found stimulating and rewarding. 3 Days at Jay Abraham’s Bootcamp made me ten times more money than my MBA ever did and Tony Robbin’s Mastery University taught me more about human psychology that I ever learnt in my Ph.D. Organisational Behaviour Seminars. And for the record, I did a post-graduate law degree in taxation, wealth creation and asset protection to save money on my taxes. BECAUSE if I can do it, then you can too. I’ve developed systems, strategies, checklists and templates to make it easier, quicker to get from where you are to where you want to be. When I first published my book “Get The Best Grades With The Least Amount Of Effort”, I hesitated because it could be construed as ‘cheating’ the academic system, but it’s not. When you cut corners or cheat, you’ll get caught and pay the price. But what if there was a way to take a short cut without cutting corners? I found LITERALLY THOUSANDS OF WAYS – I call them distinctions and I’ve published more than 1,000 and that is just a fraction of what I’ve been able to come up with and put to paper. Imagine what that would be worth to you if you could receive one EVERY WEEK? Increase your sales by 10% by revealing one strategy GUARANTEED to get 1 out of every 10 clients to buy twice what they’re buying from you right now. Double the prospect funnel you currently sell to by filling it up with equally or more qualified prospects who want to buy from you. 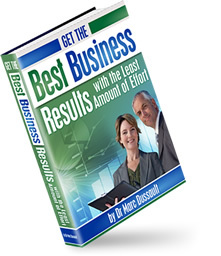 Enhance your bottom line with 20 to 35% more profitability from 25 to 40% of your sales. Show you how you can get paid for things you do now for free without upsetting your clients. Uncover hidden opportunities and assets that are right there, under your nose that you can turn into $10,000 to $30,000 in cash within 60 to 90 days. Get other people to build your business for free – in some cases faster than you can! Even if I show you how, you won’t do it. That’s why what I’m talking to you about today is the lowest-price program we offer, it’s called the Business Mastery Silver Massive Momentum Membership. Click on the hyperlink to read 10 pages of business building tools, techniques and tips that will transform your business from mediocre to cash cow within the next 12 months. GUARANTEED. If at any point, you’re not getting 5 to 10 times your money’s worth, you just stop the membership and keep everything we’ve given you up to that point. $97 is less than what the average person spends on their coffee and muffins. That sure says a lot about people who say they can’t afford it, but that’s not you. You’re still reading because you know that even though you’ve under-achieved you’ve done alright for yourself and $97 is nothing if what I say is true. But this is ALL ABOUT YOU. You need to be held accountable – and you will be. TO YOURSELF LIKE NEVER BEFORE. You won’t let yourself off the hook. How do I know that? Because you won’t throw $97 out the window every month. $97/month is enough for you to have skin in the game and play full-on. $97/month is low enough not to be a valid obstacle to your dreams. How do I know if this is going to work? It’s $97. How much time and effort are you going to SPEND to vet it out? Don’t you think that “analysis paralysis” is part of your problem? What do I get for $97? Do you really think it matters WHAT you get? Isn’t it more important WHAT YOU DO and PRODUCE with it? Think about it this way. What if I had an Aladdin’s Lamp and I could give you ONE WISH EVERY MONTH… You’d pay $97 for that wouldn’t you? This is the same thing except YOU RUB YOUR OWN LAMP as often as you want. If you don’t believe this stuff can work – this is not for you. Anthony Robbins explained it best when he said that “The level of success you will achieve is directly proportional to the level of UNcertainty you can embrace“. If you can’t handle a $3/day decision, this is not for you. Yeah, yeah, I can hear you from all the way over here.. He’s a billionaire. OK, but do you think he got to be a Billionaire by not making $97 decisions? I don’t think so and neither do you. So this is when you CLICK HERE right now, skip the 10 pages of descriptions and purchase the Silver Momentum Membership. When you sign up using this SPECIAL LINK, you’ll pay your $97 deposit and your first month (Total A$194) which will trigger your SPECIAL BONUSES WORTH more than $1,000 over the course of your 12-month membership! Go on, I’ve said enough – become a Silver Member today – call Gulliver on 0401 923 582 or click here now.